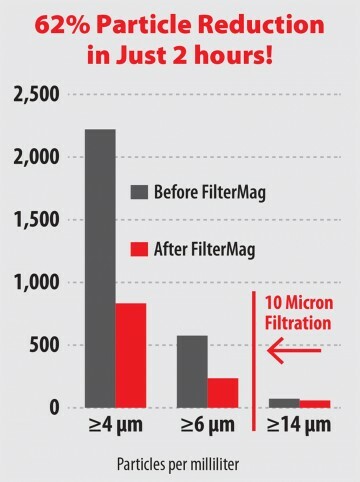 FilterMag was proven to quickly reduce particle counts when tested in the laboratory of a major hydraulic equipment manufacturer. 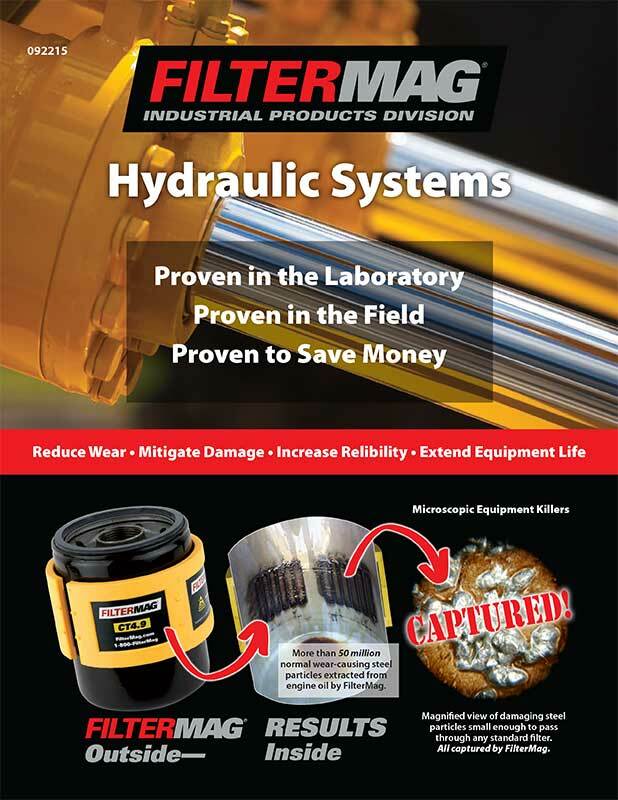 Inside, outside, fixed, or mobile—FilterMag works where your hydraulics work. even when failure is inevitable. 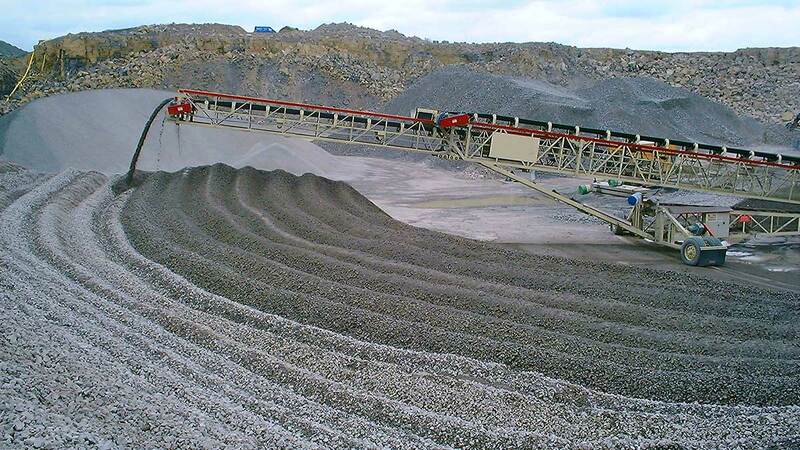 When a hydraulic pump fails, the downstream particles can wreak havoc with your system. FilterMags installed on your high pressure filters can capture most of the damaging debris too small for your filters to stop. This can significantly reduce the amount of time and labor required to get up and running again. savings in excess of $3 million as a result of FilterMag. What is a day of downtime worth to you? A cut open high pressure hydraulic filter that is showing tens of millions of particles captured during a hydraulic pump failure. Most particles are smaller than 10µm. 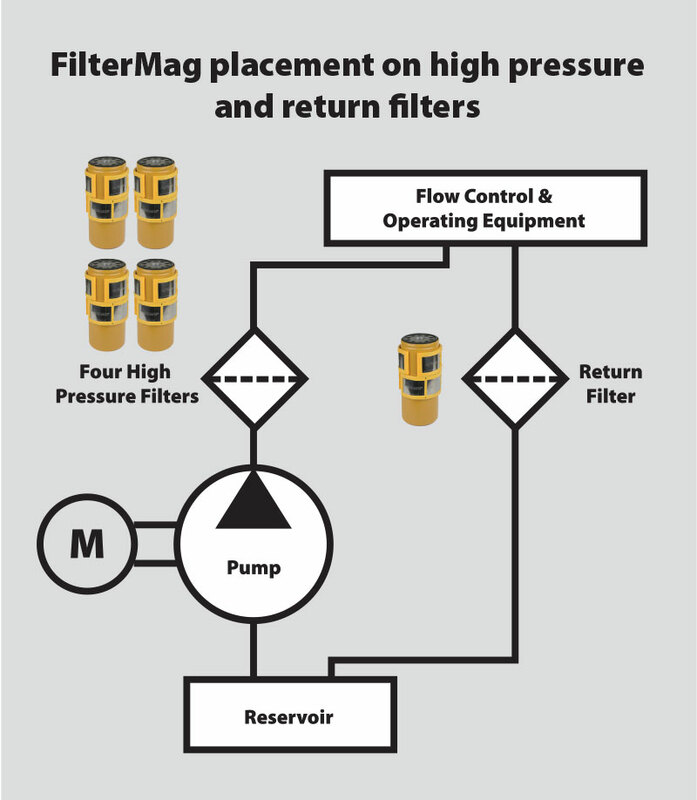 Four FilterMag CT4.9s were installed on each of the four high-pressure filters positioned immediately after the pump. 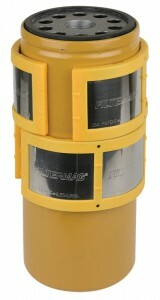 The single return filter received four additional CT4.9s. 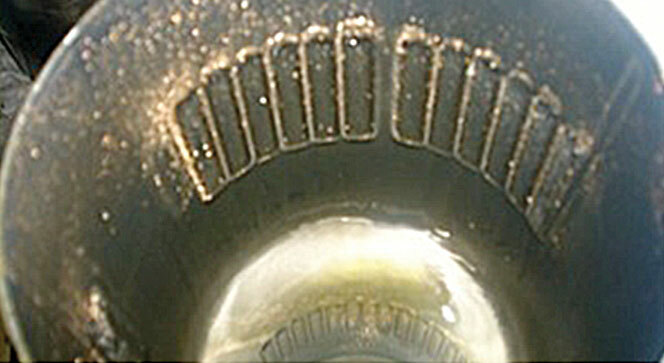 Three weeks after installation, a pump failure generated a storm of particles from the Nibral (nickel bronze aluminum alloy) impeller. 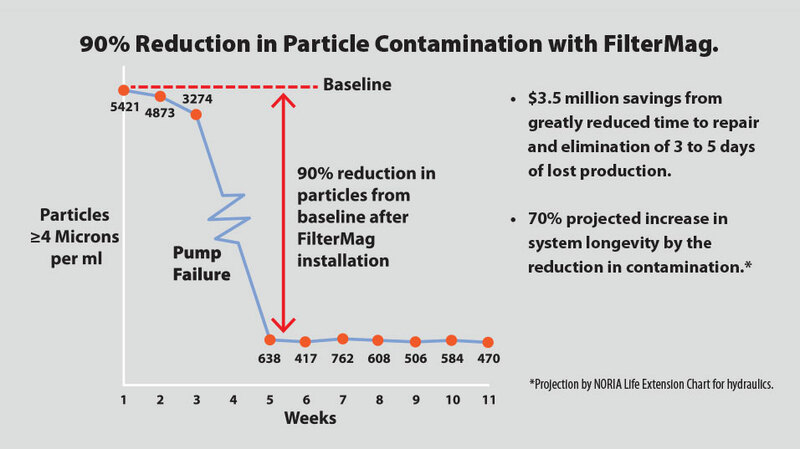 Nickel is highly susceptible to magnetism, so FilterMag caught 69 million particles that would have passed through the 10 µm filters contaminating the hydraulic piping system and degrading the process equipment. Historically, this type of failure would require 4–10 days of downtime to repair. Cleaning out the hydraulic piping (pigging the lines) was a substantial part of the repair process. Because FilterMag captured virtually all of the impeller debris, the lines only required a flush. The pump, filters, and fluid were replaced and the stacker was back to work in less than two days. 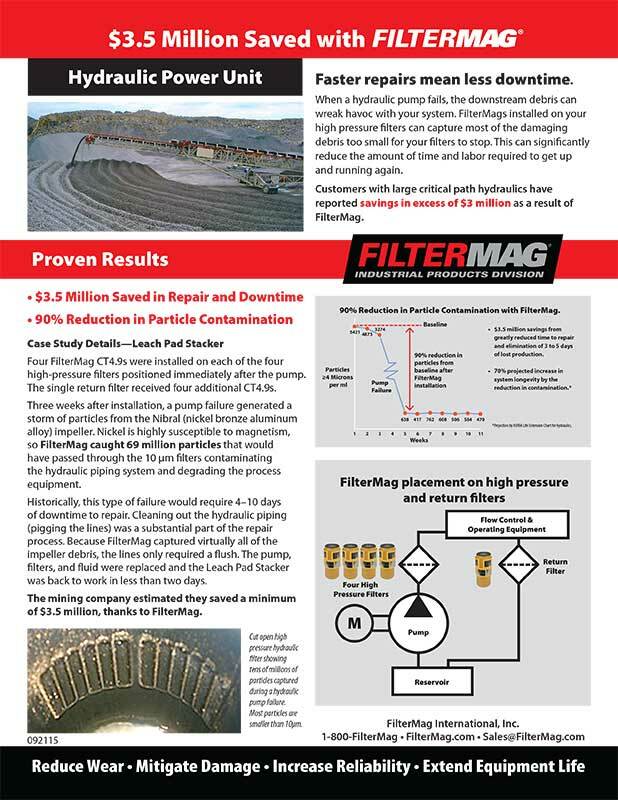 The mining company estimated they saved a minimum of $3.5 million, thanks to FilterMag. 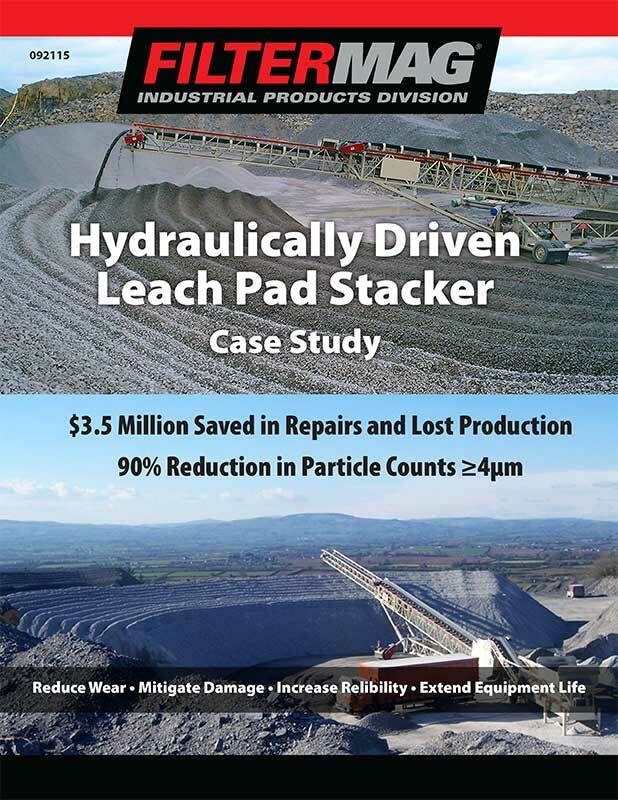 An 80% particle reduction in hydraulic fluid equates to a 60% life extension. Improving the cleanness of the fluid enables an additional 6,000 hours of operation before the system will require rebuilding. The additional hours reduced the hourly operating rate by 38%. 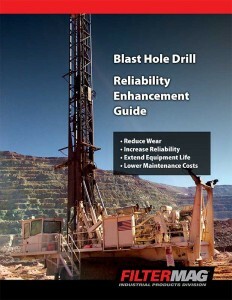 The Blast Hole Drill hydraulic system uses four FilterMag XT4s installed on each of the four canister filters. 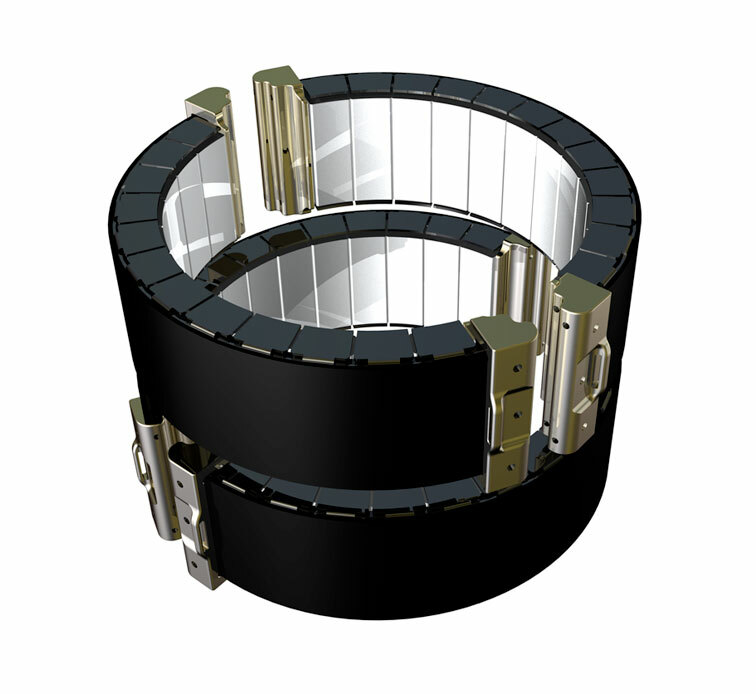 An 800 Ton Hydraulic “Hot Press” came from the OEM with a partial flow 3µm filter. A 25µm “Kidney Loop” filtration system was added to the 500 gallon hydraulic reservoir. After maintenance, the system was filled with new AW46 hydraulic fluid. The press was restarted and run under normal operating conditions for 14 days with periodic fluid sampling conducted. The new oil was tested before filling. Samples were also taken at 1 hour, 7 days, and 14 days. After the 14 day sample, eight FilterMag CT4.9s were installed on the two kidney loop filters. The machine ran for an additional hour with the FilterMags installed before another sample was taken. 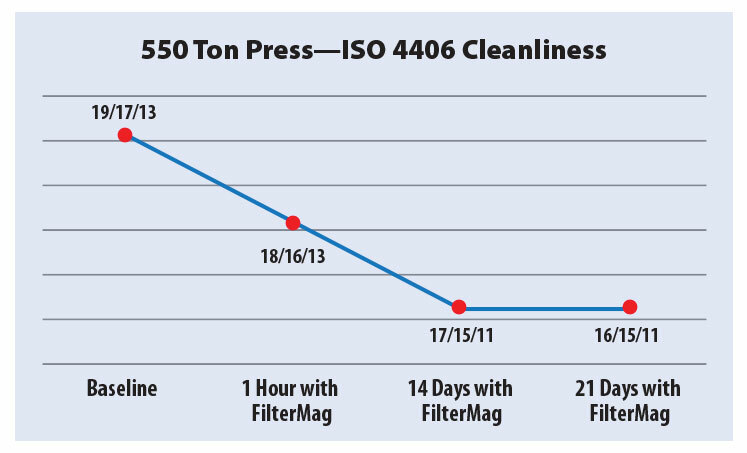 Conclusion: With original OEM filtration, particle counts rose from 14/13/9 to 18/16/13 in just 14 days. 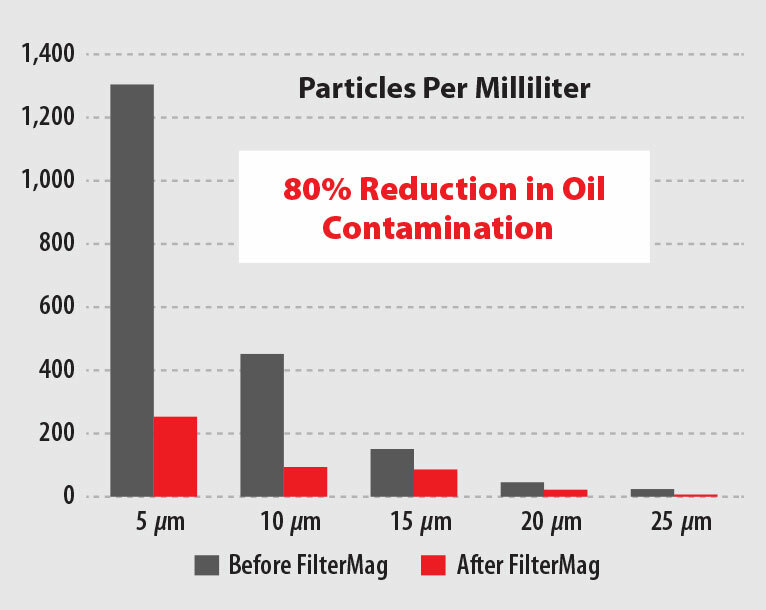 After one hour of operation with FilterMags the particle counts dropped 84%. This means higher reliability and a longer service life. 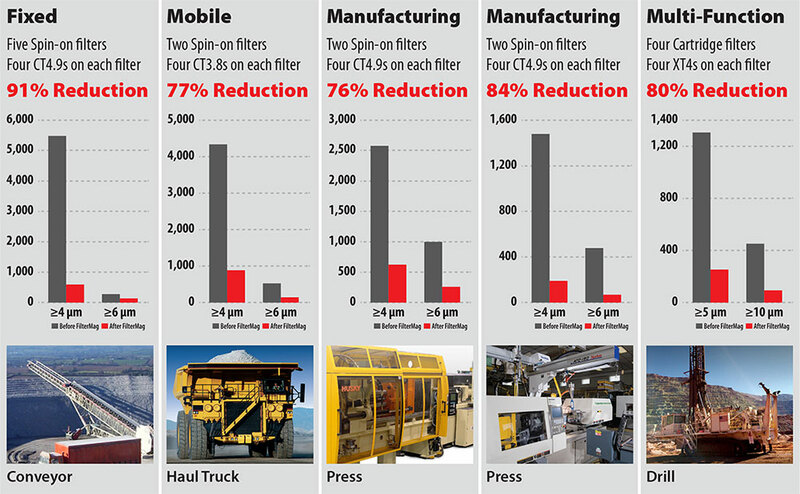 Based on the cost of downtime, the FilterMags would be fully paid for if the cleaner fluid prevented just one serious outage during the entire life of the machine. 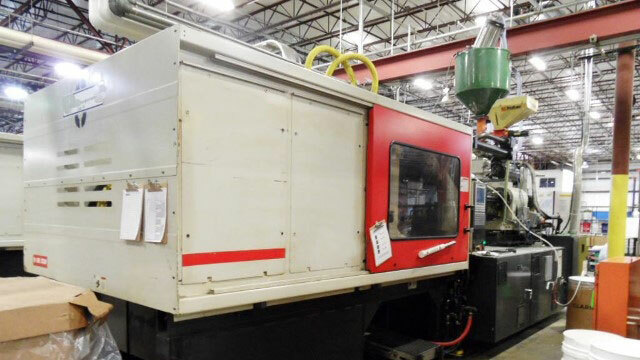 A 550 Ton Hydraulic “Hot Press” came from the OEM with a full flow 25 µm filter. A “Kidney Loop” filtration system with water removal was added to the 260 gallon AW46 hydraulic reservoir. 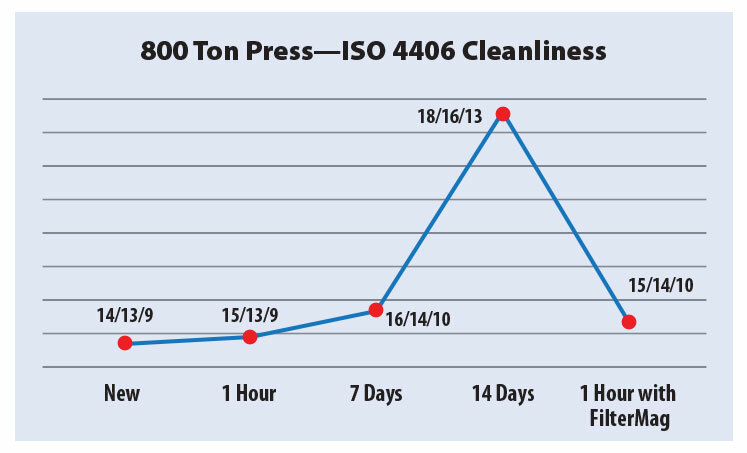 The company had established target cleanliness codes for their presses at 17/15/12 but continually operated at 1-2 code levels higher. Eight FilterMag CT4.9s were installed on the two kidney loop filters. The machine was run for 21 days under normal operating conditions with periodic fluid samples being taken. This means higher reliability and a longer service life. 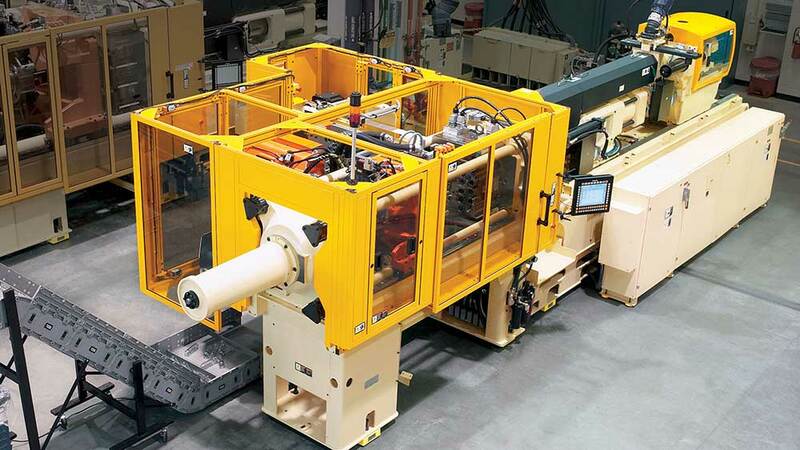 Based on the cost of downtime, the FilterMags would be fully paid for if the cleaner fluid prevented just one serious outage during the entire life of the machine.